FRESNO, Calif. -- In a trailer park tucked among irrigated orchards that help make California's San Joaquin Valley the richest farm region in the world, 16-year-old Giselle Alvarez, one of the few English-speakers in the community of farmworkers, puzzles over the notices posted on front doors: There's a danger in their drinking water. Uranium, the notices warn, tests at a level considered unsafe by federal and state standards. The law requires the park's owner to post the warnings. But they are awkwardly worded and mostly in English, a language few of the park's dozens of Spanish-speaking families can read. "It says you can drink the water - but if you drink the water over a period of time, you can get cancer," said Alvarez, whose working-class family has no choice but keep drinking and cooking with the tainted tap water. "They really don't explain." Uranium, the stuff of nuclear fuel for power plants and atom bombs, increasingly is showing in drinking water systems in major farming regions of the U.S. West - a natural though unexpected byproduct of irrigation, drought, and the overpumping of natural underground water reserves. An Associated Press investigation in California's central farm valleys - along with the U.S. Central Plains, among the areas most affected - found authorities are doing little to inform the public at large of the risk. That includes the one out of four families on private wells in this farm valley who, unknowingly, are drinking dangerous amounts of uranium. Government authorities say long-term exposure to uranium can damage kidneys and raise cancer risks, and scientists say it can have other harmful effects. In this swath of farmland, roughly 250 miles long and encompassing cities, up to one in 10 public water systems have raw drinking water with uranium levels that exceed safety standards, the U.S. Geological Survey has found. More broadly, nearly 2 million people in California's Central Valley and the U.S. Midwest live within a half-mile of groundwater containing uranium over the health limits, University of Nebraska researchers said in a study in September. Entities ranging from state agencies to tiny rural schools are scrambling to deal with hundreds of tainted public wells. That includes water wells at the Westport Elementary School, where 450 children study outside the Central California farm hub of Modesto. At Westport's playground, schoolchildren take a break from tether ball to sip from fountains marked with Spanish and English placards: "SAFE TO DRINK." The school is one of about 10 water-well systems in Central California that have installed on-site uranium removal facilities in recent years. Prices range from $65,000 to millions of dollars. Just off Westport's playground, a school maintenance chief jangles the keys to the school's treatment operation, locked in a shed. Inside, a system of tubes, dials and canisters resembling scuba tanks removes up to a pound a year of uranium from the school's well water. The uranium gleaned from local water systems is handled like the nuclear material it is - taken away by workers in masks, gloves and other protective garments, said Ron Dollar, a vice president at Water Remediation Technology, a Colorado-based firm. It is then processed into nuclear fuel for power plants, Dollar said. Before treatment, Westport's water tests up to four times state and federal limits. After treatment, it's safe for the children, teachers and staff to drink. Meanwhile, the city of Modesto, with a half-million residents, recently spent more than $500,000 to start blending water from one contaminated well to dilute the uranium to safe levels. The city has retired a half-dozen other wells with excess levels of uranium. State officials don't track spending on uranium-contaminated wells. But the state's Water Resources Control Board identified at least $16.7 million the state has spent since 2010 helping public water systems deal with high levels of uranium. 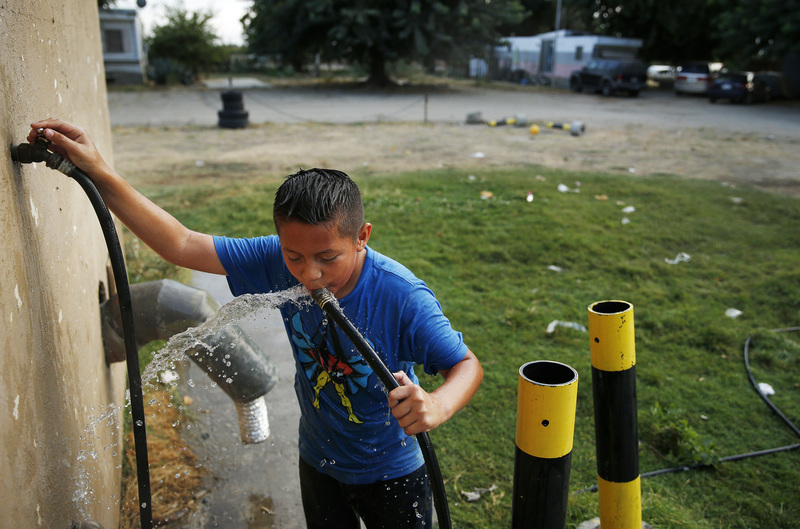 In coming years, more public water systems likely will be compelled to invest in such costly fixes, said Miranda Fram, a researcher with the U.S. Geological Survey in Sacramento. Fram and her colleagues believe the amount of uranium increased in Central Valley drinking water supplies over the last 150 years with the spread of farming. In California, as in the Rockies, mountain snowmelt washes uranium-laden sediment to the flatlands, where groundwater is used to irrigate crops. Irrigation allows year-round farming, and the irrigated plants naturally create a weak acid that is leeching more and more uranium from sediment. Groundwater pumping pulls the contaminated water down into the earth, where it is tapped by wells that supply drinking water. The USGS calculates that the average level of uranium in public-supply wells of the eastern San Joaquin Valley increased 17 percent from 1990 to the mid-2000s. The number of public-supply wells with unsafe levels of uranium, meantime, climbed from 7 percent to 10 percent over the same period there. "We should not have any doubts as to whether drinking water with uranium in it is a problem or not. It is," said Doug Brugge, professor of public health and community medicine at Tufts University School of Medicine in Boston. "The larger the population that's drinking this water, the more people that are going to be affected." In California, changes in water standards since the late 2000s have mandated testing for uranium in public water systems. For private well-owners and small water systems, however, officials were unable to point to any public health campaigns in the most-affected areas, or any help testing or dealing with uranium-contaminated wells. "When it comes to private domestic wells, we do what we can to get the word out. It's safe to say that there's always more than can be done," said John Borkovich, head of water quality at the state Water Resources Control Board. The Associated Press commissioned independent sampling of wells at five homes in the countryside outside Modesto. The results: Water from two of the five private wells tested over the government maximums for uranium - in fact, two and three times the maximum. None of the five families had ever heard that uranium could be a problem. "It would be nice to be informed, so we can make an informed decision, and those wells can be tested," said Michelle Norleen, one of the five, who was later relieved to learn her own water had tested safe.